Familias Unidas is a family-focused preventive intervention that has been found to reduce drug use and sexual risk behaviors among Hispanic adolescents. In some trials, Familias Unidas has also been found to be efficacious in reducing adolescent internalizing symptoms (i.e., depressive and anxiety symptoms), even though the intervention did not specifically target internalizing symptoms. This study examines potential mediators or mechanisms by which Familias Unidas influences internalizing symptoms, specifically the role of intervention-targeted improvements in parent-adolescent communication and reductions in youth externalizing behaviors. A total of 213 Hispanic eighth grade students with a history of externalizing behavior problems and their primary caregivers were recruited from the public school system. Participants, with a mean age of 13.8 years, were randomized into the Familias Unidas intervention or community practice control condition and assessed at baseline, 6, 18, and 30 months post-baseline. A cascading mediation model was tested in which the Familias Unidas intervention was hypothesized to decrease adolescent internalizing symptoms through two mediators: improvements in parent-adolescent communication leading to decreases in externalizing behaviors. Findings show that the intervention had significant direct effects on youth internalizing symptoms at 30 months post-baseline. In addition, the cascading mediation model was supported in which the Familias Unidas intervention predicted significant improvements in parent-adolescent communication at 6 months, subsequently decreasing externalizing behaviors at 18 months, and ultimately reducing youth internalizing symptoms at 30 months post-baseline. 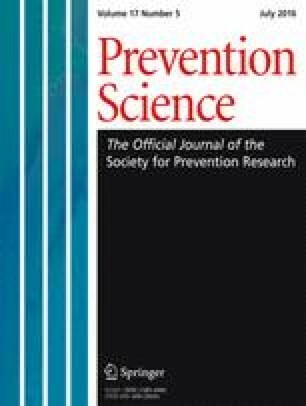 Implications for prevention interventions are discussed. This study involved analyses of data from a randomized controlled trial funded by the National Institute on Drug Abuse Grant No. R01-DA017462—Hilda Pantin, Principal Investigator. The analyses were also supported by the National Institute of Mental Health grant number R01-MH040859)—C. Hendricks Brown, Principal Investigator. This study was approved by the University of Miami’s Human Subjects Research Board and the Miami-Dade County Schools’ Research Board. All procedures performed in this study involving human participants were in accordance with the ethical standards of the institutional and/or national research committee and with the 1964 Helsinki declaration and its later amendments or comparable ethical standards. This article does not contain any studies with animals performed by any of the authors. Informed consent was obtained from parents of all youth in this trial. Voluntary informed assent was obtained from all youth in this trial.